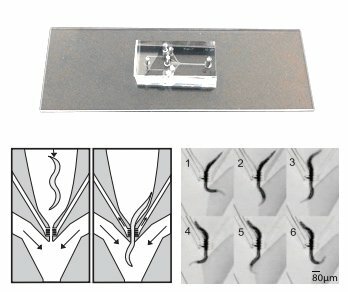 The Stimulus Preference Chip allows you to perform highly quantitative chemotaxis and odortaxis phenotypic assays with precise microfluidic control by restraining a worm with minimal immobilization so the worm can freely behave. The worm can choose between two separate stimulus streams with different chemicals, foods, odors, or temperatures. How does the Stimulus Preference Chip work? The nematode is held in place by a restraint that aligns the longitudinal axis of the body with the border between two laminar fluid streams, leaving the animal’s head and tail free to move. The content of the fluid streams can be manipulated to deliver step gradients in space or time. The Stimulus Preference Chip can be used as a stand-alone product. Figure 1. Behavioral responses to step gradients in chemoattractant concentration. Mean head angle of wild type animals and tax-4 mutants by stimulus epoch. Error bars are s.e.m. Click HERE for more data. What are the minimal requirements for set-up? See Stimulus preference chip user guide for more information about the set-up. How do I set-up the chip? Watch the video below. See Stimulus preference chip user guide for more information. What stage of worms does the stimulus preference chip accommodate? The stimulus preference chip is designed to accommodate first-day adults. What type of stimuli can the chip deliver? The chip can deliver any water soluble compound as a stimulus in any of the four inputs. The chip can be operated in spatial or temporal modes. In the spatial mode, the solutions in the left and right channels are different. For example, the left and right solutions could be NaCl at different concentrations, yielding a step-wise concentration gradient. Or, the left and right solutions could contain the same concentration of NaCl and KCl, respectively, to measure the worm’s preference for Na+ and K+ ions. In the temporal mode, the worm experiences a sudden shift between two stimuli that are each delivered symmetrically. For example, the left and right channels could first contain a solution low in NaCl that is then switched to a solution high in NaCl to measure the worm’s response dynamics. How many worms can I screen with one chip? If solutions are well filtered to prevent the chip from clogging (e.g., 0.2 um for bacteria-free solutions), there is essentially no limit on the number of worms that can be tested in a single experimental session (e.g. one day in the lab). The chip can often be reused on subsequent days if it is cleaned and dried according standard procedures described in the User’s Guide. This procedure works best when inorganic compounds are used as stimuli. In the case of organic odorants, there is the concern that these are retained by the chip to an unknown degree after cleaning. In this case, it is safest to use a new chip between daily sessions. A similar concern exists when bacteria are used as stimulants. How do you load the chip? See Stimulus preference chip user guide. How long does it take to load the chip? 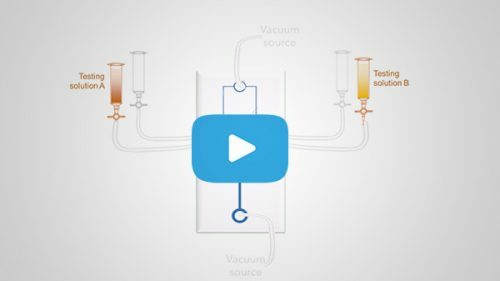 It takes about 5 min to load the chip with testing fluids at the start of an experiment. It takes about the same amount of time to wash and load a worm. Does it need to be taped to bench for loading? We recommend viewing the chip on a stereomicroscope. Taping the chip to the microscope stage is necessary to keep it from moving as the stopcocks are adjusted, worms are inserted and removed. How many worms can you load at a time (is there a waiting area like for the ScreenChips)? We recommend loading one worm at a time into the chip for more consistent behavioral results. There could be progressive changes in metabolic state as worms in the chip wait for their turn to perform. How does preparation of the worm differ between the ScreenChip and the preference chip? The main difference is that worms are washed in bulk for the ScreenChip, but individually for the Preference Chip. How do you load the stimuli? What type of data can be acquired with this chip? The chip is designed primarily for the collection of behavioral data in several forms. These include the percentage of time the worm’s head resides on the left or the right side of the chip, and mean head angle in the chip (measured with respect to the worm longitudinal axis of the body in the worm clamp). Video recordings of worm behavior (30 frames/sec) can be analyzed in MATLAB using a custom routine to compute head angle θ in each image. Mask and threshold the frames to obtain an image of the worm. Starting at the position of the restraint, traverse the centerline to find the tip of the head, defined as the point furthest from the restraint. How long can I keep the worm "immobilized" in the chip? You can keep the worm trapped in place for up to 20 min. Can I recover my worms? Yes, worms can be readily flushed out of the chip and recovered at the end of each experiment. Is it compatible with the ScreenChip system? Do you need the ScreenChip system to operate the stimulus preference chip? Size: 1" x 3" glass slide. Stage: For first day adult C. elegans.